How about a commuter hyperloop? Navigating right-of-way for land development can be like drawing blood from fiercely independent landowners. But a San Antonio technology startup is banking that it has cracked the code to prying some surface rights from Texans by borrowing a concept familiar to them — royalties, not eminent domain. Oil and gas companies routinely knock on doors of Texas ranchers and cattle owners to offer mineral royalties in exchange for leasing surface rights to conduct deep drilling operations. But instead of a heavy industry use, these surface rights would be for a clean technology powered bullet train that runs inside an above ground pipeline structure and offer profit dividends. A bullet train building startup called Transonic Transportation LLC that recently relocated to San Antonio from its roots in Louisiana has its eye on an alternative to the Lone Star Rail project — a commuter train line that would connect downtown San Antonio to the urban core of Austin along the I-35 corridor that’s been abandoned by Union Pacific after a deal fell through. The startup claims that eminent domain won’t be as much of an issue since the train platform is held up by concrete pylons rather than laid on the earth. So hypothetically, landowners could still have access to travel underneath the tracks, if necessary. The company plans to use hyperloop technology, a trademark of SpaceX, a research and development firm. Hyperloop refers to a train inside a tube that glides on a magnetized track. But the California tech giant SpaceX, doesn’t have plans to commercialize it. The prototype still in design phase could transport between 6,000 and 12,000 passengers per hour and cost between $8 to $12 per trip for consumers.The funding structure would be that of a public-private partnership rather than a bond supported or taxpayer-subsidized effort. Transonic Transportation’s co-founder, Joshua Manriquez is a civil engineer by training and now has a team working on blueprints and patent pending technology for a Texas hyperloop train system. Manriquez was part of the Louisiana State University team that made it through the design phase during the competition in early 2016 held by SpaceX. Since then, the startup has secured a 1-mile-long test track in Mississippi and aims to raise roughly $300,000 in a seed funding round within the next year. The company also has a testing facility in San Antonio. Manriquez said he’s reached out to Lone Star Rail and is waiting for a response but would move forward independently on a Texas hyperloop train system once the funding is secured. Here’s their website, where they claim the trip time would be 15 minutes. I’ve blogged a few times about hyperloops – see here, here, and here for more on them. The Lone Star Rail proposal to connect Austin and San Antonio may or may not be dead, so if nothing else this is an intriguing possible alternative. It’s also a creative way around the possible eminent domain issues that Texas Central is facing, though there’s no guarantee of that. In any event, I look forward to seeing if this idea gets any traction. Link via Streetsblog, and Texas Monthly has more. State Rep. Byron Cook asked Texas Attorney General Ken Paxton on Friday to rule on whether a private company developing a high-speed train project in the state has the power of eminent domain. Texas Central Partners has been developing a privately funded bullet train intended to travel between Houston and Dallas in less than 90 minutes. While the project has garnered strong support in those cities, residents in the largely rural communities along the proposed route have voiced opposition. Cook’s request asks Paxton to determine whether the company has the right, under state law, to enter private property to conduct land surveys “and ultimately take” private land. There are currently hundreds of private companies afforded eminent domain authority in Texas, including dozens of private railroad companies, according to a list maintained by the state Comptroller. Railroad companies have eminent domain rights in Texas, and as of today that includes high-speed rail companies, though Sen. Lois Kolkhorst tried to pass a bill last session that would have ended that. It seems likely she or some other legislative opponent of Texas Central will try again next year, but in the meantime Rep. Cook has asserted in his request for an opinion that TCR doesn’t qualify as a railroad company, at least not as intended by the law as originally written. That feels like legal hair-splitting to me, but these things happen when 19th century legislation is applied to 21st century reality. As we know, AG opinions do not carry the force of law, but it would carry some weight in the litigation that would be sure to follow. Keep an eye on this. Texas Central Railway (TCR), a Japanese funded Texas-based private railroad company, is set to build and operate a high speed train system from Dallas to Houston. With stations slated only at the ends of the line, the train will run at over 200 mph through some of Texas’ most beautiful farmland, marring the landscape and tranquility of our great state, as well as displacing families and disrupting farming and ranching operations. Closer into the terminating cities, historic neighborhoods and small businesses will be affected in irreparable ways. Property value loss, probable tax hikes to offset lost revenue from lowered property values, property loss, environmental impacts, lack of economic benefit and noise/vibration disruptions will all impact the lives of so many Texans. We all oppose the current primary and secondary routes being selected by Texas Central Railway. Help us save our homes and farmland from this high speed train by voicing your opposition! More than 800 people packed the Lone Star Community Center in Montgomery Monday night to learn what they can do to stop a proposed multibillion-dollar high-speed rail route that would cut through West Montgomery County and connect Houston with Dallas. According to local legislators and county elected officials, the Texas Central Railway, a private company planning the high-speed rail, has the power of eminent domain to make the project happen. “I am not a happy camper,” said state Rep. Will Metcalf, R-Conroe, adding he is frustrated by the lack of transparency on the project. “They are moving forward and we need your help. Metcalf urged residents to contact U.S Rep. Kevin Brady, R-The Woodlands, U.S. Sen. John Cornyn, R-Texas, and U.S. Sen. Ted Cruz, R-Texas. “When Montgomery County is joined together, we are unstoppable,” Metcalf said. Precinct 2 Commissioner Charlie Riley told the crowd that even though the project would cut through his precinct, he has not been contacted by TCR about the rail line. He said he is determined to stop the project. “Whatever we need to do to stay united and stay strong, we will support it to make sure this doesn’t happen,” Riley said. I’ve discussed the Montgomery County issues before. At one point, Montgomery County Commissioners Court passed a resolution saying they would oppose any alignment that didn’t include the I-45 corridor. The impression I get now is that the locals there would prefer to try to kill project altogether. They’ve started collecting the support of elected officials to back them up. A story in the Leader News from a couple of weeks ago that as far as I know never appeared online mentioned three State Senators that have signed a letter to TxDOT opposing the use of eminent domain and any state funds for this project – Sen. Lois Kolkhorst was one, Sen. Brandon Creighton was another, and (oops!) I can’t remember the third. There’s a great irony here in that one of the selling points of the TCR approach has been that by not seeking public money for the rail line they can avoid a lot of the political battles and streamline the process. That sure doesn’t appear to be the case any more. Meanwhile, the Houston-based opposition is still looking for alternate routes. So what is the alternative? Civic leaders from the neighborhoods under threat from the two proposed routes have joined together to chart a better way forward, seeking solutions that will allow high-speed rail to serve Houston without blighting residential neighborhoods – theirs or anyone else’s. This inter-neighborhood working group has put forward two suggested approaches. The first is to terminate the line outside Houston’s central business district, at a location such as the Northwest Transit Center, an idea that Texas Central Railroad itself has floated. Unlike many other cities, Houston has multiple commercial centers, and much of the potential ridership here is located west and northwest of downtown. An express bus service or a light-rail line could connect the terminus with downtown; at a public meeting last fall, a METRO spokesperson embraced the idea of providing such a connection. And terminating the high-speed rail line outside the Central Business District would avoid exacerbating traffic and parking problems the way a downtown terminus would, with riders from around the city having to travel downtown to reach it. Alternatively, if a downtown terminus is deemed necessary, the approach to downtown should be routed not through residential neighborhoods but down highway or industrial corridors. A route along I-45 was one of the routes examined and rejected by the Federal Railroad Administration, but deserves reconsideration. 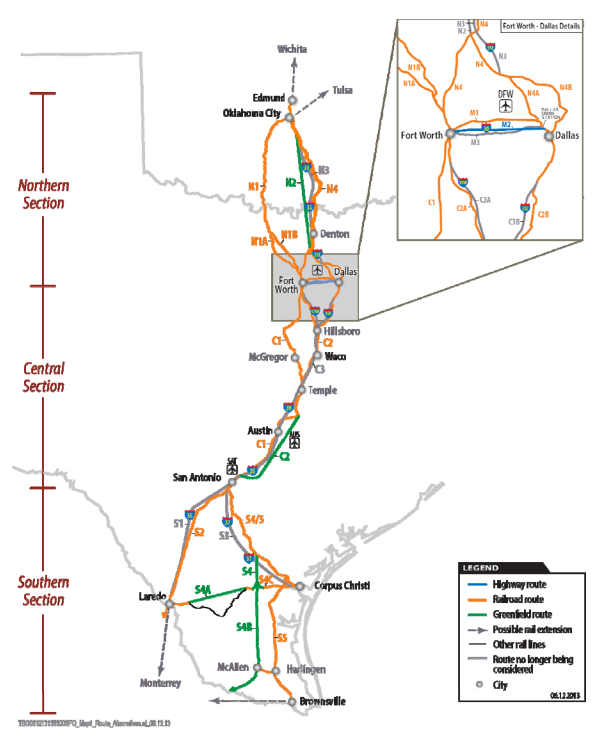 A route along I-10, which Texas Central Railroad representatives have acknowledged as worthy of consideration, should also be investigated as a way to reach central Houston. Several other variations, involving the Hempstead/290 corridor, I-610 North Loop, and/or the Harris County Hardy Toll Road corridor, are worth looking into. See here for the background. The actual route has not been determined yet, and as this statement from Texas Central, posted on the No Texas Central Facebook page, makes clear, even the two “preferred routes” that have been highlighted so far are really just corridors. We won’t have a clear idea of what we might get until the Federal Railroad Administration posts the scoping report to its website. In the meantime, there’s still a lot of opportunity to affect things. I’ll continue to keep an eye on it. The Texas Farm Bureau endorses no one in the Governor’s race. The Texas Farm Bureau, which has feuded with Rick Perry over toll roads and private-property rights, opted Wednesday not to endorse anybody in the governor’s race. The decision was the first time the Farm Bureau’s political committee has not backed the Republican nominee for governor since it began making endorsements in 1990. Spokesman Gene Hall said the bureau’s Friends of Agriculture Fund voted to stay neutral. Democrat Bill White’s campaign hailed the decision as a victory. “Bill White is committed to private property rights, while Perry’s spent years obsessed with the corrupt land grab of the Trans-Texas Corridor,” said spokeswoman Katy Bacon. I figure stuff like this is the result of Perry’s “screw everybody except the base” strategy. I mean, it should be a no-brainer for him to get the Farm Bureau endorsement. Other than the occasional conservative, ag-friendly, incumbent Democrat, they endorse Republicans. Sure, they had a falling out with Perry over eminent domain in 2007 and the TTC before that, but they still have a lot in common, and there’s no reason why Perry couldn’t have found some way to win them back. You have to wonder how many people Perry can kick out of his circle before his circle becomes too small for him to win. He seems determined to find out, that’s for sure. The Chron endorses Prop 11, which is the constitutional amendment to limit eminent domain takings that were allowed by the Supreme Court’s 2005 Kelo ruling. [It] would prohibit “the taking, damaging, or destroying of private property” for purposes of economic development. The Houston Chronicle urges a vote for Proposition 11. It was for good reason that the high court ruling in Kelo v. City of New London alarmed many property rights advocates here and elsewhere. It upheld the taking by right of eminent domain of private residences by the Connecticut city for purposes of economic development and expanding the tax base. Proposition 11 would prevent takings of property for either of those reasons. Preventing takings for economic motives is consistent with Texans’ historically strong support for property rights. At the same time, it would not impede eminent domain takings for necessary purposes. In situations where economic development is the objective it is simple fairness to give property owners the benefits of choice, and of a marketplace sale. To force a sale upon them under such inflexible circumstances is inimical to constitutional principles enumerated in the takings clause. Opponents contend a constitutional amendment is unnecessary and that the state courts should be allowed to clear up any potential problems in Texas. Maybe so, but that is no match for the carved-in-stone finality of an amendment. Maybe it’s just my distrust of anything pushed by Rick Perry, but I’m not sold on Prop 11. I fear that this amendment will be interpreted too broadly, and since it’s an amendment it’d be near impossible to fix. But maybe I’m just being paranoid. Can anyone convince me one way or the other on this? In other constitutional amendment news, Land Commissioner Jerry Patterson wrote an op-ed in favor of Prop 9, and in the interest of equal time sent it out with an opposing argument, which was written Pacific Legal Foundation attorney J. David Breemer. You can read Patterson’s piece here, and Breemer’s piece, which is more about the Open Beaches act in general and not specifically about Prop 9, though if you agree with his position you’d certainly vote against it, here. Just yesterday, the Chron wrote an editorial about how everything was coming up roses and daffodils for Metro lately, thanks to some federal funding (with more in the pipeline) for the light rail expansion and a generally favorable political climate. So naturally, what do we see today but this article about a sneak attack in the Lege on the Universities line. The proposal, which still faces an uphill battle in the final days of the legislative session, was quietly attached last week to a loosely related bill by House lawmakers. “It effectively kills the light rail program,” said George Smalley, Metro’s vice president for communications and marketing. The new restrictions, if enacted, would limit the agency’s eminent domain authority, needed to buy property for the rail lines, if a route differs from the 2003 referendum that authorized the light rail program. The restrictions mirror the rhetoric of rail critics, who say the location of the controversial University Line down Richmond and Westpark doesn’t conform to the referendum. “If you lose a line like the University Line because you lost the power of condemnation, then the whole thing is at grave risk,” Smalley said. State Rep. Joe Pickett, who chairs the House Transportation Committee, said he added the new restrictions at the request of rail critics by amending another bill, which regulated fare enforcement by mass transit agencies. The El Paso Democrat said they convinced him that the transit agency hadn’t complied with the referendum. He said he hadn’t talked with the agency, though, before adding the language. At issue is whether it’s lawful to build a line partially on Richmond when the ballot described it as being on Westpark. The agency says the largest share of the line would, in fact, be on Westpark, adding that the ballot referred to a general location, the details of which should be based on federally required cost and ridership studies. Those indicate that a segment should be on Richmond. Pickett said he is open to changing the language. “If … they intend to meet their promise that they made, then they shouldn’t have a problem,” he said. “It was pretty clear that there was a referendum that did state where (the line) was going, and we were just asked to ratify that.” The legislation came to light just as agency officials were hopeful that, after years of debate and uncertainty, they would have the funding and political support to move forward. So once again, the people who lost the election and whose lawsuit is currently going nowhere have shown that they will do anything to overturn the will of the people and stop light rail in Houston. I’m amazed that they were able to influence Rep. Pickett, and appalled that he couldn’t have been bothered to at least ask Metro for a response. I’m sorry, but that’s just ignorant. Clearly, Rep. Pickett needs to hear from some people who are not anti-Metro crusaders. Feel free to give his office a call and tell him – politely! – that you support light rail in Houston, that you support Metro’s current expansion plans as they now stand, and that you oppose any effort by the Legislature to affect those plans. His Austin office number is (512) 463-0596 and his district office number is (915) 590-4349. If you do make a call, leave a comment here and tell us what kind of response you got. Thanks very much. The bill in question is SB1263. Here’s the committee substitute version of the bill. The relevant text is the underlined section that begins “This subsection applies only to an authority created under Chapter 451, Transportation Code, that operates in an area in which the principal municipality has a population of 1.9 million or more.” You could mention that you oppose this amendment that’s been added to the committee substitute version of SB1263 when you call Pickett’s office. By the way, there’s a real irony here in a sneak attack, made behind closed doors with no public input or notice, on an agency that’s often criticized for not operating in a transparent manner. I daresay some of the people who are behind this covert operation have been quoted in the Chronicle at one time or another berating Metro for not being more open about what it’s doing. And yet here they are, skulking through a back door, without the rest of us even having any idea who’s behind it. Way to go, y’all. The good news is that Houston lawmakers are not going to take this lying down. The bill had been planned for a local and consent calendar reserved for non-controversial or limited measures that draw little debate, perhaps on Wednesday. But the controversy appeared likely to force the measure to be considered like any other complex legislation. With only a week left in the session, and with hundreds of bills in line for consideration, the bill might never get a vote. Several lawmakers have also said they would fight any attempt to tie the agency’s hands. “I’ve got my eye on it,” said state Rep. Wayne Smith, R-Baytown, who predicted that the bill wouldn’t survive in its current form. That’s nice to hear. It would also be a good idea to call your own Rep and Senator and tell them you oppose Pickett’s amendment that removes Metro’s eminent domain power in the committee substitute for SB1263. Especially with all that’s going on right now in the House, let’s take nothing for granted.